Permissive parenting is a type of parenting style characterized by low demands with high responsiveness. Permissive parents tend to be very loving, yet provide few guidelines and rules. These parents do not expect mature behavior from their children and often seem more like a friend than a parental figure. These parents tend to be the polar opposite of the so-called "helicopter parents." Instead of hovering over their children's every move, permissive parents are incredibly lax and rarely make or enforce any type of rules or structure. Their motto is often simply that "kids will be kids." While they are usually warm and loving, they make little or no attempt to control or discipline their kids. Because there are few rules, expectations, and demands, children raised by permissive parents tend to struggle with self-regulation and self-control. Based on her research with preschool-age children, developmental psychologist Diana Baumrind described three major parenting styles. In later years, researchers would continue to investigate the different styles of parenting and even added a fourth style. Permissive parenting is one of the original parenting styles described by Baumrind. Permissive parenting is sometimes known as indulgent parenting. Parents who exhibit this style make relatively few demands on their children. Because these parents have low expectations for self-control and maturity, discipline is a rarity. According to Baumrind, permissive parents "are more responsive than they are demanding. They are nontraditional and lenient, do not require mature behavior, allow considerable self-regulation, and avoid confrontation." Researchers have found that the overly relaxed approach to parenting exhibited by permissive parents can lead to a number of negative outcomes. Children raised by permissive parents tend to lack self-discipline, possess poor social skills, may be self-involved and demanding, and may feel insecure due to the lack of boundaries and guidance. Display low achievement in many areas. Because their parents have little to no expectations of them, these kids have nothing to strive toward. Studies have linked permissive parenting to lower academic achievement. Make poor decisions. Since their parents to not set or enforce any type of rules or guidelines, these kids struggle to learn good problem-solving and decision-making skills. Display more aggression and less emotional understanding. Because they do not learn to deal with their emotions effectively, particularly in situations where they do not get what they want, children with permissive parents may struggle when faced with stressful or emotionally difficult situations. May be more prone to delinquency and substance use. Studies suggest that children raised by permissive parents are more likely to engage in misconduct and alcohol or substance use. Unable to manage their time or habits. Because of the lack of structure and rules in the home, these kids never learn limits. This might lead to watching too much television, playing too many computer games, and eating too much. These children never learn to limit their screen time or eating habits, which can lead to unhealthy habits and obesity. In one study, permissive parenting was linked to underage alcohol use; teens with permissive parents were three times more likely to engage in heavy drinking. Researchers also suggest that permissive parenting is linked to other risky behaviors such as drug use and other forms of misconduct. Because permissive parenting involves a lack of demands and expectations, children raised by parents with this style tend to grow up without a strong sense of self-discipline. They may be more unruly in school due to the lack of boundaries in the home, and may be less academically motivated than many of their peers. Since these parents have few requirements for mature behavior, children may lack skills in social settings. While they may be good at interpersonal communication, they lack other important skills such as sharing. What Can You Do About Permissive Parenting? If you tend to be a pushover or struggle to enforce rules, consider looking for ways that you can develop some more authoritative parenting habits. This can be difficult at times, because it often means becoming stricter, enforcing rules, and being able to cope with your child being upset. Develop a list of basic household rules. In order for your kids to know how they are supposed to behave, they need to clearly understand what your expectations are. Make sure your kids understand the penalty of breaking the rules. Guidelines are useless unless there is some sort of consequence for failing to follow them. Time-outs and losing privileges are logical consequences for breaking the household rules. Follow through. This can be the greatest struggle for parents who tend to be permissive, but it is important. Try to be firm and consistent, but still loving. Help your kids understand why such rules are important by providing adequate feedback and explanations, but still make sure that consequences are in place. Reward good behavior. Try to catch your children being good and allow special privileges when they display these actions. 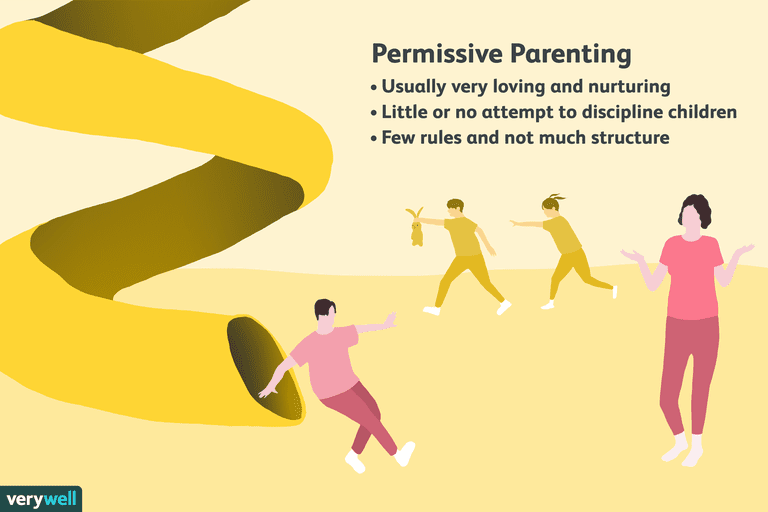 Permissive parenting can lead to a number of problems, so it pays to consciously try to utilize a more authoritative approach if you recognize these signs of permissiveness in your own parenting. If you tend to be more of a permissive parent, think of ways that you can help your children understand your expectations and guidelines and be consistent about your enforcement of these rules. By providing your kids with the right balance of structure and support, you can ensure that they grow up with the skills they need to succeed in life. Bahr, S. J. & Hoffmann, J. P. (2010). Parenting style, religiosity, peers, and adolescent heavy drinking. Journal of Studies on Alcohol and Drugs. 2010;71: 539-543. Jago R, Baranowski T, Baranowski JC, Thompson D, Greaves KA. BMI from 3– 6 y of age is predicted by TV viewing and physical activity, not diet. International Journal of Obesity. 2005; 29(6):557–564. Santrock, J.W. A topical approach to life-span development, 3rd Ed. New York: McGraw-Hill; 2007. Underwood MK, Beron KJ, Rosen LH. Continuity and change in social and physical aggression from middle childhood through early adolescence. Aggressive Behavior. 2009 Sep-Oct; 35(5):357-75. Williams LR, Degnan KA, Perez-Edgar KE, Henderson HA, Rubin KH, Pine DS, Steinberg L, Fox NA. Impact of behavioral inhibition and parenting style on internalizing and externalizing problems from early childhood through adolescence. Journal of Abnormal Child Psychology. 2009; 37(8):1063-75.